Although it’s familiar in cooking nomenclature, the word “smothering” bears a faintly sinister connotation. Luckily, the results dispel any notion of foul play. Simple, homey dishes strongly associated with the South, smothered meats are often served with a flour-thickened gravy. 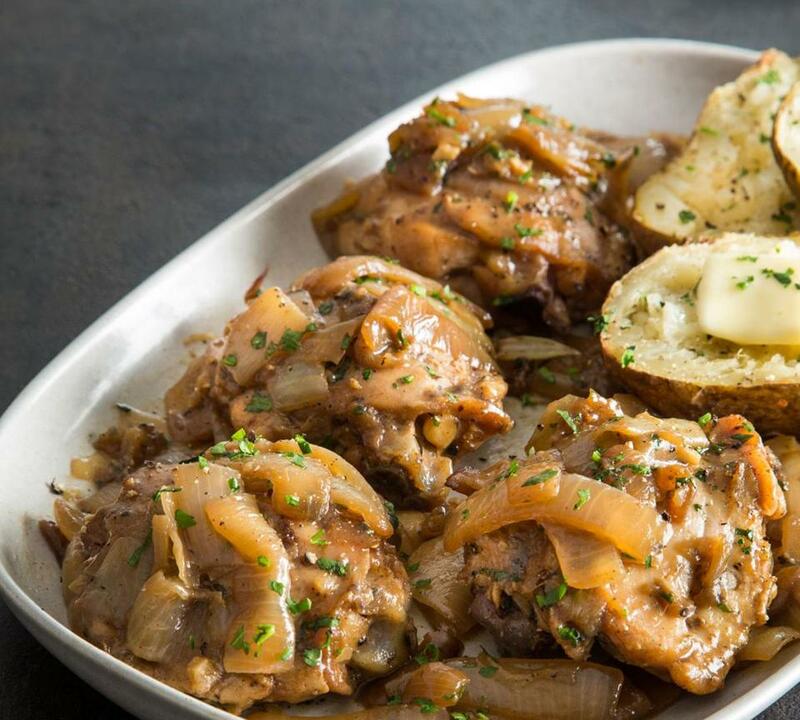 These recipes, however, represent a lighter take — essentially braises with lots of onions and no added liquid. Meat and onions create a natural “jus” with a pure, uncomplicated flavor. I reduce it a little to concentrate, and add a bit of butter to the meat dishes for richness and sheen, but that’s all. Save the gravy for Thanksgiving. Hot buttered grits, white rice, or baked potatoes (white or sweet) are great alongside this simple, aromatic chicken dish, adapted from The Gift of Southern Cooking, by Edna Lewis and Scott Peacock. Chicken thighs are my first choice, but white meat fans can use a whole chicken cut into 10 serving pieces (with each breast half split into two pieces). After browning the breast pieces, don’t return them to the pan until you turn over the other pieces (with about 20 minutes of cooking time left). In a large, straight-sided saute or braising pan (with a cover) over medium-high, heat the oil until shimmering. Sprinkle the chicken all over with salt and pepper, arrange the pieces skin side down in the skillet (do not crowd — work in batches if necessary), and cook, undisturbed, until skin is crisp and golden brown, about 5 minutes. Turn the chicken and continue to cook, undisturbed, until second side is golden brown, about 5 minutes longer, adjusting the heat if the skillet becomes too hot. Transfer the chicken to a large plate and, if necessary, repeat with remaining pieces. When the chicken is cool enough to handle, remove and discard the skin. Remove all but 1 tablespoon of fat from the pan. Return the pan to medium-high heat, add 1 tablespoon butter, and melt. Add the onions, bay leaves, and ½ teaspoon salt and cook, stirring and scraping the bottom of the pan to dissolve the fond, until the onions begin to soften, about 5 minutes. Adjust the heat to medium and continue to cook, stirring and scraping the bottom of the pan occasionally, until very soft and golden, about 8 minutes longer. Add the garlic and thyme and cook, stirring, until fragrant, about 1 minute. Add the chicken with its accumulated juices, burying the pieces in the onions, and bring to a simmer. Adjust the heat to medium-low, cover the pan, and simmer gently until the chicken is cooked through and very tender, about 40 minutes, turning the chicken over (and adding the breast pieces, if using) halfway through. Leaving the onions and liquid in the pan, transfer the chicken to a platter and cover loosely with foil to keep warm. Adjust the heat to medium-high and bring the liquid to a strong simmer. Add ½ teaspoon salt and pepper to taste and continue to simmer, stirring occasionally, to reduce the liquid and concentrate the flavors, about 5 to 6 minutes, adding any juices accumulated on the platter about halfway through. Remove the bay leaves if desired, and adjust the seasoning with salt and pepper if necessary. Add the remaining 1 tablespoon butter and most of the parsley and stir to melt and incorporate the butter. Pour and scrape the onions and juices over the chicken, sprinkle with the remaining parsley, and serve at once. Note that these meaty country-style ribs require a much longer cooking time than the chicken thighs. If you happen upon some pork rib chops or blade chops, you could use those instead of the ribs, and they’ll cook somewhat faster (be sure to check for doneness sooner). 1) Substitute 8 bone-in country-style pork ribs (about 1 inch thick and 8 ounces each; 4 pounds total), patted dry, for the chicken thighs. Brown the ribs as directed, cooking them, undisturbed, until well browned on the bottom, 2½ to 3½ minutes, turning them over, and continuing to cook, undisturbed, until well browned on the second side, 2½ to 3½ minutes longer. 2) After removing the browned ribs from the pan, add 2 more teaspoons of vegetable oil along with the butter and cook the onions as directed. 3) Substitute chopped fresh rosemary for the thyme. 4) Cook the ribs in the onion mixture until they are very tender (the tip of a paring knife inserted into the chops will meet little resistance), about 2 to 2½ hours. 5) Leaving the onions and liquid in the pan, transfer the ribs to a platter, cover loosely with foil to keep warm, and finish the dish as directed. 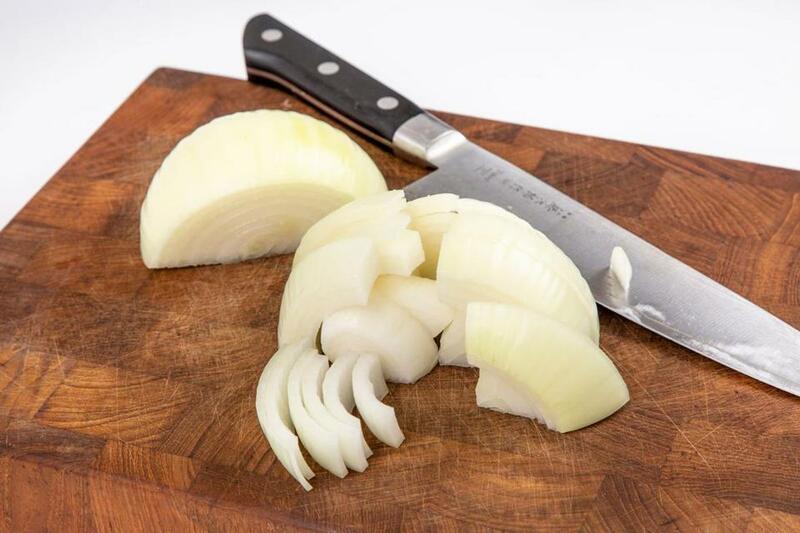 To create the especially large chopped onion pieces I like for these dishes, quarter the onions lengthwise, and then quarter each of those quarters crosswise. I like the flavor boost of using chicken broth, but you can substitute water if you’d like. Also, for another sweet and tart dimension of flavor, try adding a large apple, peeled, cored, and cut into chunks the same size as the turnip pieces, in the last 4 minutes of cooking. In a large, heavy, straight-sided saute or braising pan (with a cover) over medium heat, fry the bacon, stirring occasionally, until bacon is crisp and the fat has rendered, about 8 minutes. With a slotted spoon, transfer bacon to paper towels to drain. Pour off all but 1½ tablespoons of the bacon fat, return the pan to medium heat, add the onions and ½ teaspoon salt, and cook, stirring and scraping the bottom of the pan occasionally, until very soft, about 10 minutes. Add the cayenne and sugar and cook, stirring, until fragrant, about 40 seconds. Add the broth and stir and scrape the bottom of the pan to dissolve the fond. Add the turnips, ½ teaspoon salt, and ground black pepper to taste, stir, and bring to a strong simmer. Adjust the heat to low, cover the pan, and cook, stirring often to promote even cooking, until turnips are tender and most of the liquid has evaporated, about 12 to 16 minutes, adding more broth near the end if the pan looks dry. Uncover the pan, add reserved bacon, parsley, and most of the scallions, and stir. Adjust the seasoning with salt, ground black pepper, and sugar, if necessary. Scrape the mixture into a serving bowl if desired, sprinkle with remaining scallions, and serve.